Scott Bradlee’s Postmodern Jukebox is a musical collective of singers and musicians that takes current day songs and translates them to the music of yesteryear. Some of their most popular covers take songs like “All About That Bass”, “We Can’t Stop”, and “Oops...I Did It Again” and turns them into doo wop, jazz, and swing tunes. Their YouTube channel has over three million subscribers, and nearly a billion views. The song “Alone” by Marshmello is their latest cover, and it features vocalist Niia. The original version by Marshmello peaked at number 60 on the Billboard Hot 100, and was certified Platinum by the RIAA. PMJ’s music video was released on March 1, 2018, and has already accumulated nearly a quarter of a million views. Niia spends the whole video swinging while singing into the microphone. PMJ bills this cover as an “enchanted jazz forest style”, and that’s quite accurate description of the song. The song features a marimba and a piano heavy melody that is the driving force behind that enchanted sound. This is bolstered by Niia’s angelic, almost ethereal voice that you can easily imagine coming from an enchanted forest. The version differs quite drastically from the original Marshmello one. Marshmello’s version features a lot of electronic sounds and samples vocals, where as the PMJ version is all live, acoustic instruments and vocals. This may be a cover of a wildly popular track, but Postmodern Jukebox completely make it their own in an original way. Niia wears optical white high top chucks throughout the music video. The majority of Postmodern Jukebox videos are shot at what’s called the “PMJ Mansion”. They are also all shot with the band and vocalists wearing period accurate clothes that match whatever style of music they’re singing. 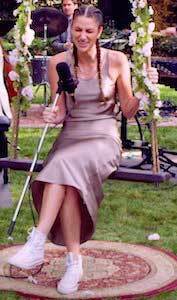 To continue on with the forest aesthetic, the band and Niia are placed in the manion’s garden, with Niia swinging on a flower decorated swing throughout. She is dressed in a shimmering grey gown and pure white chucks that give her a glamorous yet natural look. 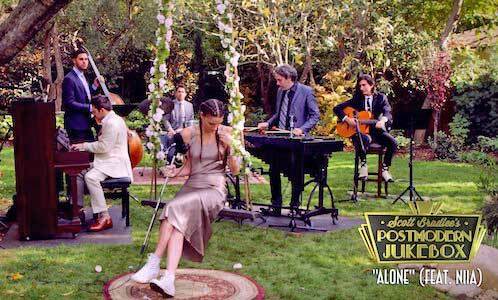 The music video is simple in that it is one static shot of the band performing the song, with Niia swinging the whole time. This fits with the sound of the track as her swaying fits in with the ethereal sound. Overall, the music video and song work well together, and the track is a wonderful example of how to take a song and completely make it your own. Swinging without a care in the world!